Immigration Court outcomes in credible fear reviews (CFR) have recently undergone a dramatic change. Starting in January 2018, court findings of credible fear began to plummet. By June 2018, only 14.7 percent of the CFR Immigration Court decisions found the asylum seeker had a "credible fear." This was just half the level that had prevailed during the last six months of 2017. See Figure 1. Supporting details are found in Table 1. This recent change has major implications. Unless the asylum seeker who is otherwise subject to expedited removal passes the CFR review, he or she is not allowed even to apply for asylum. This applies to most parents arriving with children at the southwest border. As a consequence, individuals who don't pass these reviews are usually quickly deported back to their home countries. * Excludes a small number where decision unknown. These very recent data from the Immigration Court provide an early look at how the landscape for gaining asylum may be shifting under the current administration. Initially, the Department of Homeland Security (DHS) determines whether in its view the person has a credible fear of persecution if returned to his or her home country. This review generally takes place within days of arrival at the border. If the DHS asylum officer decides after informally interviewing the individual that he or she has not met this credible fear standard, the asylum seeker may ask that this decision be reviewed by an immigration judge. Here again the review generally happens quickly and the asylum seeker must explain why they are seeking asylum. Despite the inordinate complexities in asylum law, as a rule no attorney is allowed to help individuals at their hearings. Yet an unfavorable decision at this stage ends the process. The judge's decision cannot be further appealed, and deportation quickly follows. The observed decline in pass rates parallels a growing drumbeat of pronouncements by Administration officials about "baseless and fraudulent asylum applications," and an alleged seriously flawed system currently used to adjudicate these claims. For example, in a speech delivered by Attorney General Sessions in October 2017 to an audience of immigration judges, he called for "elevat[ing] the threshold standard of proof in credible fear interviews," and criticized the award of asylum in too many alleged meritless cases. In March Sessions announced he was reviewing several Board of Immigration Appeals (BIA) asylum decisions with a view to limiting hearings, and restricting grounds for granting asylum. In June, Session handed down a wide-ranging decision reversing long standing precedent and generally finding that now neither domestic abuse nor gang violence were legitimate grounds for granting asylum. There are additional issues in credible fear reviews. The latest available case-by-case court records obtained and analyzed by the Transactional Records Access Clearinghouse (TRAC) at Syracuse University document that depending upon the particular Immigration Court undertaking the credible fear review, the proportion of asylum seekers passing this screening step varied from as little as 1 percent all the way up to 60 percent - a sixty-fold difference. Thus, whether or not asylum seekers receive favorable CFR court decisions appears to be largely driven by which Immigration Court and judge heard their cases. Previous reports by TRAC and others have long documented wide judge-to-judge disparities in asylum decisions. This report breaks new ground in showing that similar differences also exist earlier in the asylum process in the determination of who is allowed to apply for asylum. These striking differences are illustrated in Figure 2. 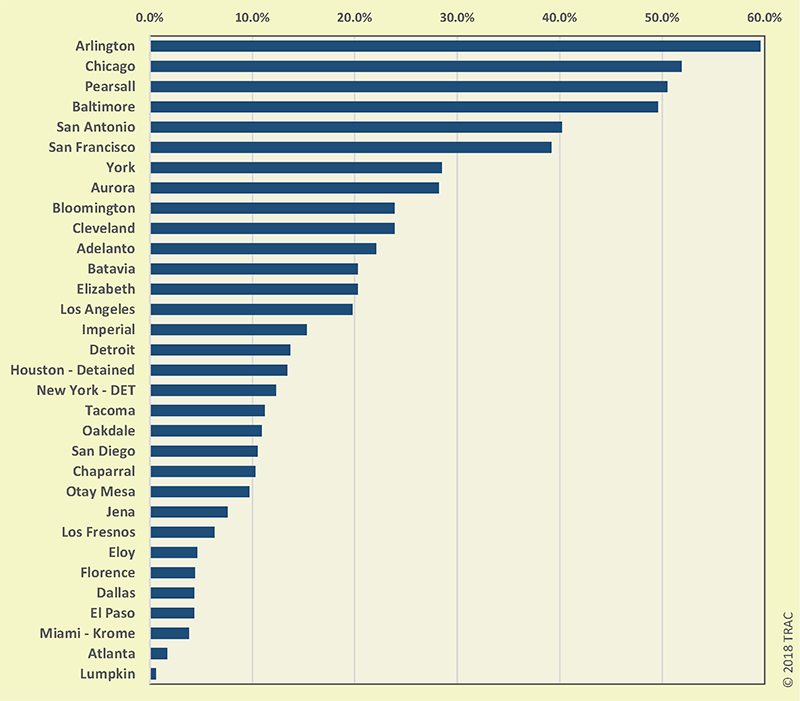 Since October 2015, for example, at least half of credible reviews found the asylum seeker had established credible fear of persecution if returned to their home country when conducted by the Immigration Courts in Arlington, Virginia (60% passed), Chicago, Illinois (52% passed), Pearsall, Texas (51% passed), and Baltimore, Maryland (50% passed). During this same period, in comparison, 40 percent of credible fear reviews conducted by the San Antonio, Texas, Immigration Court received a favorable outcome and 39 percent were found to have a credible fear in those conducted by the San Francisco, California, Immigration Court. But only 20 percent were found to meet this standard by the Los Angeles Immigration Court. In addition, since October 2015, only 1 to 2 percent were found to have credible fear when their review took place in Immigration Courts based in Lumpkin, Georgia (1% passed) and Atlanta, Georgia (2% passed). More detailed statistics for each court that heard at least 100 cases during the October 2015 - June 2018 period is given in Table 2. * Immigration Courts with at least 100 CFR or RFR decisions during FY 2016-FY 2018; if deisions in any year less than 5 no outcome percentage is calculated. The fact that there were these extreme court-to-court differences does not explain why they occurred. For example, outcomes could vary because the general "worthiness" of individuals seeking asylum varied by location, or standards used by DHS asylum officers at different locations influenced the "worthiness" of cases that sought an immigration judge's review. However, sometimes there were substantial differences among judges sitting on the same court, as well as great similarities in pass rates among judges sitting on courts with entirely different overall pass rates. Among the four Immigration Courts that decided at least a thousand cases during this period, for example, average pass rates varied from 6.3 percent to 50.5 percent. But there were individual judges in each of these four courts with low pass rates of just four per cent or less. While other judges in two of these courts - Pearsall, Texas and San Antonio, Texas - had pass rates of 94 percent. * Judge comparisons limited to those deciding at least 100 CFR cases. It has long been clear that the extreme level of disparity now present in asylum adjudication is inconsistent with our country's commitment to equal justice and the rule of law. This report provides preliminary evidence of similar disparities in the process that determines who is and isn't allowed to apply for asylum. Reasonable Fear Review cases—a process that applies to reinstatement of removal orders—have also shown a parallel drop as shown in Table 1. DHS has authority to immediately administratively deport through an "expedited removal" anyone seeking asylum apprehended by the Border Patrol between ports-of-entry, or found to be inadmissible at a port-of-entry, unless they have "credible fear" of persecution if returned to their home country. 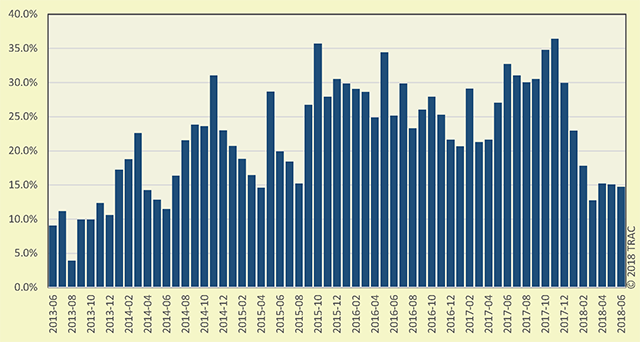 Comparable DHS asylum officer decisions for this most recent period are not as yet available. Anecdotal reports indicate that findings of credible fear by DHS are also plummeting. See: https://www.cnn.com/2018/07/14/politics/sessions-asylum-impact-border/index.html. See discussion of representation at CFRs in the Office of the Chief Immigration Judge's Practice Manual. At the discretion of the Immigration Judge, an attorney may be allowed to sit in on the court's CFR hearing but is generally not allowed to participate in any way. See: https://www.jeffreyschase.com/blog/2018/7/22/attorneys-and-credible-fear-review. See, for example, the Attorney General's March 5, 2018 decision found at: https://www.justice.gov/eoir/page/file/1040936/download, and his March 7, 2018 announcement that he was re-examining an earlier BIA decision on asylum found at: https://www.justice.gov/eoir/page/file/1041481/download. See Washington Post June 12, 2018 article on this decision at: https://www.washingtonpost.com/news/morning-mix/wp/2018/06/12/back-to-the-dark-ages-sessions-asylum-ruling-reverses-decades-of-womens-rights-progress-critics-say/?utm_term=.a62557c958fe. See TRAC's November 2017 report and reviews of individual immigration judges documenting these disparities. For an overview of TRAC's past research see sidebar in its December 2016 report. See also 2007 Stanford Law Review, "Refugee Roulette: Disparities in Asylum Adjudication". Table 2 also provides details on reasonable fear review cases at each court.